Bees hibernate in the winter and swarm every spring. This means the beehive has grown too large and when a new queen hatches, she will take part of the hive and leave to find a new home. This process is called swarming and is prevalent in early spring. Bees love to burrow inside trees and in the attics and eaves of homes. Often times, they will stop to rest on a tree branch before continuing on to find shelter. Whenever possible, Pentecost Pest Control will take the honeybees alive. However, it is not always possible when they have taken up residence inside a structure, such as an eave, attic, column or deck, without great damage to your structure. In these instances, we can eliminate the hive without any removal. To completely eliminate a honeybee hive, the queen must first be killed. This is tricky because she is always heavily protected in the center of the hive. 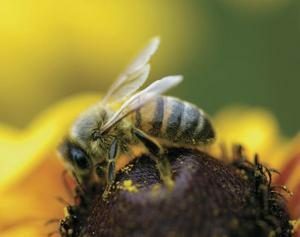 Sometimes people will try unsuccessfully to treat the bees with an over-the-counter pesticide, but it only affects the bees on the outside of the nest. Full bee control requires a bee removal specialist. In addition, we offer a full warranty on every location treated. A full hive removal is only necessary if your bee infestation has occurred longer than six weeks. Sometimes, bees will inhabit a structure for long periods of time. 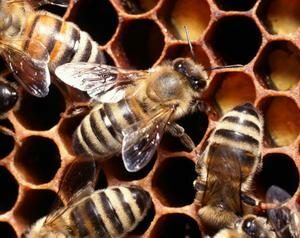 In these cases, the bees have built up a substantial amount of wax, honey and larvae. 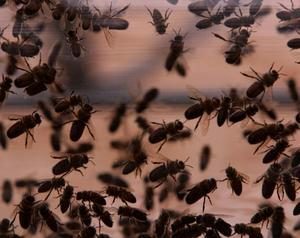 If the bees are killed and the hive is left inside the structure, not only will the wax and honey melt, causing possible damage to the inside of your home, but it draws numerous pests. Pentecost Pest Control offers a turn-key service. If the bees reside in your home, we will cut open the area, dig out all the bees, wax, honey and larvae. The area is then washed with soap and water and filled with insulation. Finally we replace any materials taken from your home, leaving it exactly as we found it. All removals are guaranteed with a two-year warranty. Please call a professional at the first sign of a bee infestation to avoid this problem. European and Southern yellow jackets are smaller than honeybees, but differ because they are hairless, very fast and feed on other insects instead of flowers. They also have a very painful bite in addition to their ability to sting repeatedly. You’ll notice them more in the fall and they are commonly found in woodpiles, burrowed in the ground or in the little weep holes around your home. Wasps are large reddish insects with a painful sting. They like to hibernate for the winter in your chimney, attic and eaves of your home. They are a real nuisance in the spring, summer and fall months. In the Stanislaus and San Joaquin areas, we are also occasionally bothered by bumblebees and cicada killer wasps. We can help no matter what your stinging insect problem.